Index on Censorship is standing with our free speech friends at Flying Dog Brewery who’ve just been told by a UK drinks marketing body they should stop selling one of the beers because the artwork — by award-winning artist Ralph Steadman — might encourage “immoderate” drinking. 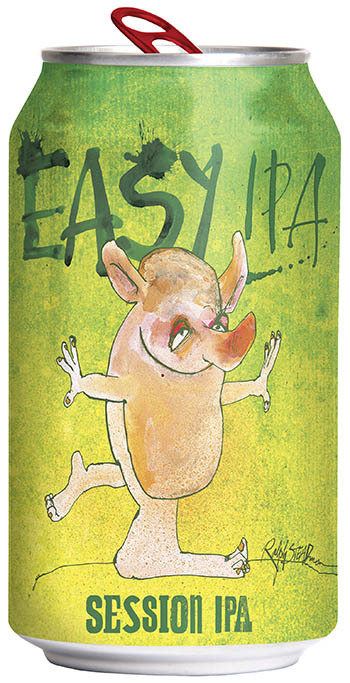 Flying Dog was told that the Portman Group deemed the artwork for its Easy IPA Session India Pale Ale could spur people to drink irresponsibly. We think this is nonsense and are pleased Flying Dog plans to ignore this ruling. The press release sent by Flying Dog Brewery is below. FREDERICK, Maryland – Flying Dog Brewery has been defending free speech and creative expression in the United States for more than 25 years. Now, it’s taking a stand in the United Kingdom. In May 2018, the Portman Group, a third-party organization that evaluates alcohol-related marketing, allegedly received a single complaint from a person who thought that Flying Dog’s Easy IPA Session India Pale Ale could be mistaken for a soft drink. After months of deliberation, the Portman Group issued a final ruling, claiming that the packaging artwork “…directly or indirectly encourages illegal, irresponsible or immoderate consumption, such as binge drinking, drunkenness or drunk-driving.” It will be issuing a Retailer Alert Bulletin on 15 October, which will ask retailers not to place orders for the beer. Notwithstanding the Portman Group’s ruling, Flying Dog has decided to continue to distribute Easy IPA in the United Kingdom. The Portman Group is an organization whose signatories include Heineken, Guinness, Bacardi, Molson, Carlsberg and InBev (among others). As James Clay, Flying Dog’s importer and UK wholesaler, are not signatories of the Portman Group, the beer will remain available in the UK market for customers to purchase as they choose. “This is about good beer and a relatively small, artisanal U.S. craft brewery standing up against a consortium of some of the largest drinks producers in the UK,” Caruso said. As one of the fastest-growing regional craft breweries in the United States, Flying Dog has been brewing world-class beer that pushes the confines of traditional styles for almost 25 years. Flying Dog attracts everyone from craft beer connoisseurs to those just catching the wave with up to 20 styles available at any given time. Introduced to Flying Dog by the Gonzo writer Hunter S. Thompson, artist Ralph Steadman has produced original art for Flying Dog’s labels since 1995. Named the Mid-Size Craft Brewery of the Year at the 2009 Great American Beer Festival (the highest honor for its size in the United States), recent accolades for Flying Dog include its Pale Ale ranked as the #1 American Pale Ale in the U.S. by The New York Times. For more information, visit www.flyingdogbrewery.com.